I've been neglecting the storyline of Bionicle so far in my reviews, because what's it matter anyway - but since we're a fair way into covering the 2008 line, let's lay out the basics anyway. There's this big giant robot god called Primus Mata Nui, right? Currently it's asleep (maybe it's in battery-save mode), and since it's God, the good guys - that's the Toa - are trying to wake it up, because God is Good (Joan Osborne said so). And the bad guys (Makuta) are getting in the way, because that's what they do. All clear now? Oh who cares - it's a bunch of alien robots fighting, that's storyline enough. Armed with a Tridax Pod, Mask of Corruption, powerful claws and poisonous fangs, Antroz leads the Brotherhood of Makuta forces in Karda Nui into the fight. This powerful warrior tears through the air on bat-like wings. So this is the boss, huh? Not the big boss, obviously - that's Makuta, since he's the one the Brotherhood's named after. Whoever heard of an evil organization naming itself after one of the henchmen? Nope, it's either named after the top dog, or an acronym that spells out some evil-sounding word like SPECTRE or KAOS. Or both at once, as in VENOM. So Antroz isn't the almighty main villain, but he's up there - definitely in the ranks of the Villainous Lieutenants rather than the Hired Goons and Disposable Minions (though if Makuta's a real villain, all of the Brotherhood are disposable). Sort of like Jaws, only I doubt this guy's going to wind up in love with a cutesy blonde. Befitting his nearly-the-villain status, Antroz is a pretty imposing figure of a Makuta - stood upright he's about 9½", with his wingtips boosting that to 11". 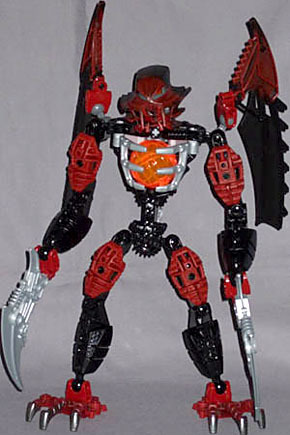 Of the three regular Makuta involved in the Phantoka conflict (that being the Bionicle equivalent of the Battle of Britain - lots of fierce dogfights in the skies of Karda Nui), Antroz is also the only one who's more or less normal, without knives for feet or crazy triple-jointed shoulders or any of that. His torso construction is slightly altered from the norm - the hip segment being lowered in where it attaches to the main body, giving him a bit of extra height - but otherwise he's pretty standard, which means he's quite a lot of fun to play with, since he's versatile and cool-looking, and doesn't have any weird shortcomings. Articulation, the usual: balljoints at the neck, shoulders, elbows, wrists, hips, knees, and ankles, plus in the mounting pieces for the wings, attached to the back of each shoulder. He gets a few points for style from basic common-sense construction - his body and limbs are all black, with bulky crimson armour units attached (matching biceps and thighs), which gives him a solid look - but the wings do a lot of the work of making him look meaner than his kin. I wouldn't have called them "bat-like" - we've got plenty of bats around here, and I've never seen any looking like that - but they're big and heavy-looking, larger both in size and impact than the wing pieces used on the other Phantoka Makuta. There's a heavy use of mechanical edges and rods in them, with the entire leading segment of each wing having a machined-looking frame around its surface, and the serrated edges and spined backs make them look really vicious. The balljoint mounts help a lot too, offering a far greater flexibility in positioning the wings than on the other Makuta - getting Antroz looking his best is a simple matter. His mask is a mean-looking piece of work too, with sharp points either side of a fanged mouth, and little sharp gaps in the face all around the jaw increasing the amount of gloomy shadows present. The red eye piece inside sits a little way back from the mask's eye sockets, so it doesn't always show through, but the mask's own colouration of blood-red face shading into black on the crest gives it a sullen, glaring look regardless. Armament-wise, Antroz has the usual Tridax pod stored in his chest, ready to pop out and release its swarm of slightly cute-looking monster leeches. Well, it's not their fault they're cute: they're little balls of soft plastic with faces; they can't help it. He's also got some seriously meaty blades for hands, heavy mechanical talons that look fit to punch right through anything they hit. Sadly, no one escaped the silliness of the piggy-backing Matoran - Antroz gets Radiak, the one who's all blades on hands and feet. 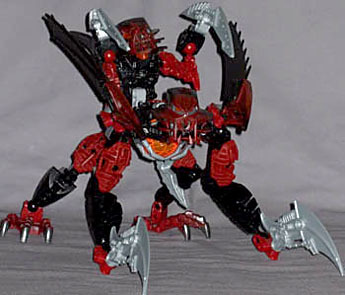 Like all the Makuta, Antroz gets down on all fours to let his buddy have a ride, but if you can get over how dopey it is to have the second-in-command (or whatever) of the Brotherhood of Makuta crawling around just to give some underling a lift, they make a certain amount of sense. Antroz's big claws make for brutal-looking forelimbs, while Radiak's long scythe-hands look decent being wielded on horseback, or thereabouts. I don't know whether it was because he's a leader, or just luck of the draw, but Antroz was seriously difficult to find around here - I'd collected every other 2008 Bionicle set, plus a bunch of 2007 ones, before I even set eyes on him. But if you're collecting the Makuta, he's worth the hunt.